You are one of the few preparing for the future of finance and are now able to move to the next stage – self-custody of your own assets. Before you can withdraw any security tokens from BnkToTheFuture.com you must have both a verified and certified account on BnkToTheFuture.com. Without this the process of withdrawing security tokens to your BF Wallet and having your wallet address whitelisted will fail. To check the status of your BnkToTheFuture.com, login to your account. On the account section you will see a drop down menu where you can click on the verification tab and check your verification status. This is where you can upload any missing documents SCH as proof of residential address and photo ID document. Once verified click on the investor status tab to check your investor status too. 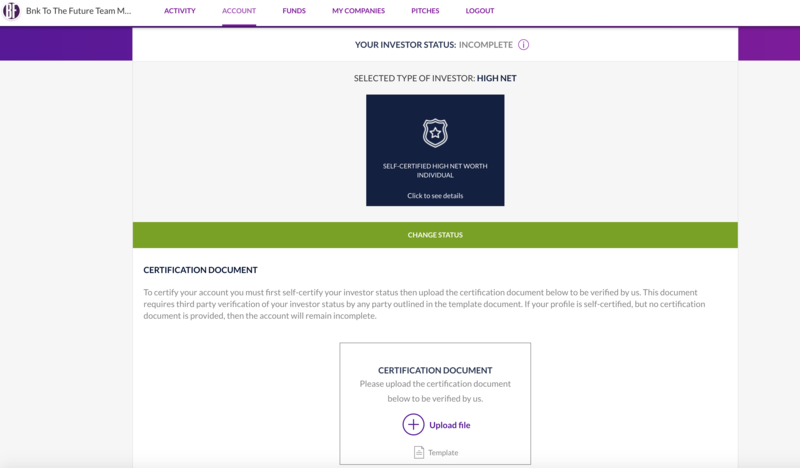 If your investor status is set to self-certified then you will need to complete the certification template provided, download the relevant part for your nationality, complete the relevant section, sign this and then upload it to your account for our team to verify. 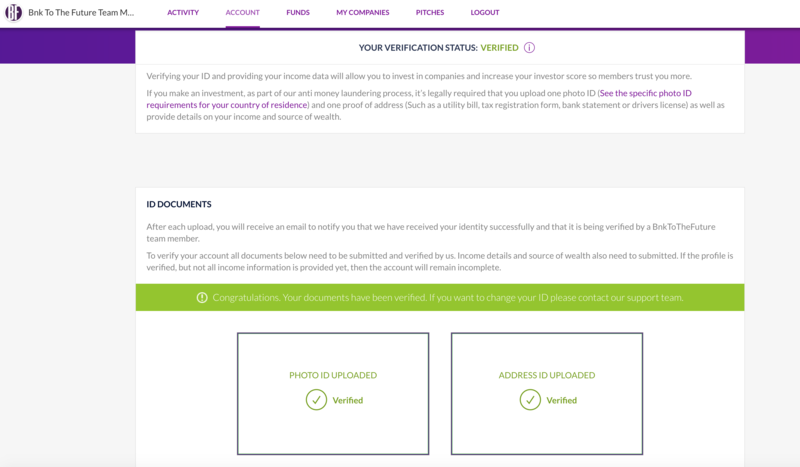 Once your photo ID, proof of address and investor certification documents have been approved your account will show as both verified and certified and you will then qualify to withdraw your security tokens. Depending on your country of residence additional documents may be required such as proof of income or assets, but if your marked as certified you are good to go. Assuming your account is both verified and certified you are now ready to withdraw your security tokens and hold them in a self-custodial way. WARNING – Once they have left your BnkToTheFuture.com account, remember these are your assets and we are no longer storing them for you. They are yours and can be sent to an exchange or any other whitelisted address that supports the trading of the security token from your BF Wallet in your control only. We cannot retrieve them for you so make sure you have the backup phrase you wrote down when setting up your BF Wallet. 1. 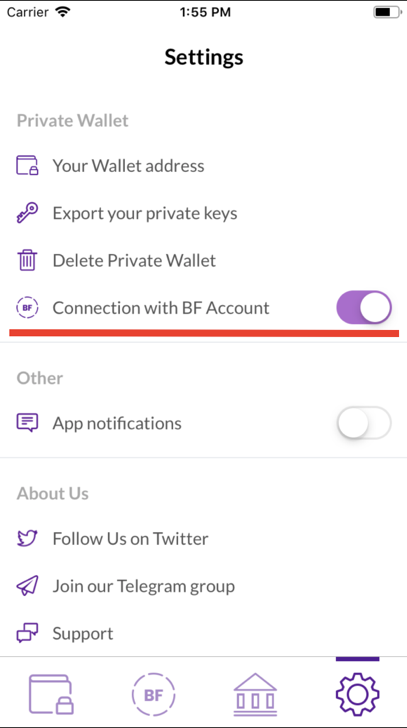 In order to kickstart the process, you should download the BF Wallet from the relevant app store (Apple or Android). Upon signup and creation of the new wallet you will need to connect with BF account, which will also initiate the whitelisting process. 2. While linking should be the default and recommended option during the signup process, should you have any doubt, please go to Settings and ensure the toggle is switched on. 4. 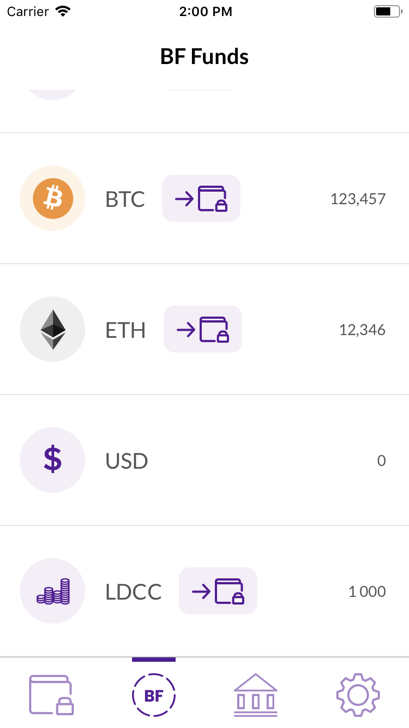 Choose the relevant Security token and click on the withdraw icon, which should be displayed to the right of the token name. 5. Input the amount you’d like to withdraw, or click on MAX with withdraw the whole available balance. 6. 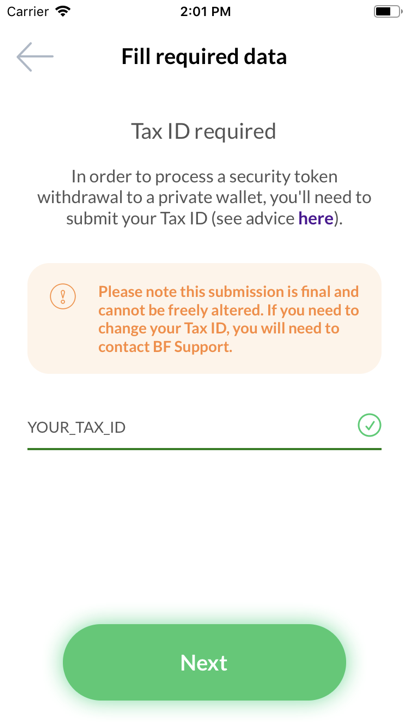 Some Security tokens may involve an additional step requiring you to provide your Tax ID, which is required for compliance reasons. This step is important as the data cannot be altered at a later stage. Should you need an advice regarding what the relevant Tax ID is and how you can obtain it if you don’t have one, simply click on the link displayed on the screen. 7. You will now be asked to provide your Two Factor Authentication (2FA) passcode to authorise the withdrawal request. Once authorised, the request will be sent for admin review and processing. Please note that the whitelisting process is recorded on the blockchain which may add additional waiting time for the tokens to reach your private wallet. While it is possible to finalise this process from your BnkToTheFuture.com account by inputting your whitelisted BF Wallet address, you may find it simplest to complete entire process from your BF Wallet interface.